Alex J. Cavanaugh: The Ninja Gets Personal! Plus Now You See Me Movie Review, Dream Theater Review, Blog Tour Tips, Curiosity Quills Anthologies, Giveaways - and Winners, and Ninja News. The Ninja Gets Personal! Plus Now You See Me Movie Review, Dream Theater Review, Blog Tour Tips, Curiosity Quills Anthologies, Giveaways - and Winners, and Ninja News. Literary Rambles - CassaStorm and CassaFire print books – comment to enter, open until September 28. Mithril Wisdom - Cassa Universe poster – comment to enter, open until October 1. Edi’s Book Lighthouse - CassaStorm eBook – comment to enter, open until October 1. Samantha Geary -CassaStorm signed print book – comment to enter, open until October 14. Literary Rambles is also participating in the Stuck in a Good Book Giveaway Hop. Lots of books to win – comment by September 25 to enter. SK Anthony’s Kinetics came out last Friday – congratulations, SK! And it was Blitz Day for her as well. We got her good! PK Hrezo is hosting her very first blogfest to celebrate her cover reveal on October 16. “Welcome to Butterman Travel, Incorporated; a full service agency designed to meet all your exclusive time travel needs.” Visit her site for details! Anthologies from Curiosity Quills Press! 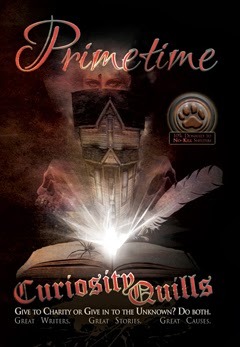 Curiosity Quills Press brings some of their bestselling authors together to create a spine-tingling, mind-blowing, quirky collection of short stories in their first ever, annual PRIMETIME Anthology, scheduled for release 7th October, 2013. 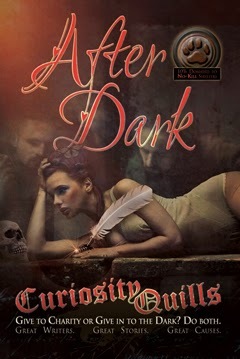 Also on that day, Curiosity Quills Press brings some of their bestselling authors together in PRIME TIME’s steamier, sexier counterpart, AFTER DARK. These anthologies are not limited to one specific genre, but all of our novels are guaranteed to be quirky and paranormal, in some way or another. We also guarantee 10% of every purchase will go straight to animals in need. The CQ team has selected humane societies on both the East and West coast that spend well and do not stray from the “no-kill” policies of their strays. Watched on NetFlix and it was a lot of fun! Clever twists as to how some of the tricks were performed and lots of rabbit chasing. The Four Horsemen were always one step ahead though, leading the police where they wanted. Excellent cast - Jesse Eisenberg, Mark Ruffalo, Woody Harrelson, Morgan Freeman, and Michael Caine. Definitely recommended! They’ve pulled away from the heavy metal sound that dominated the last few albums with former drummer Portnoy and gone back to a more progressive sound. Featuring amazing musicianship, their latest, self-titled album looks to reestablish the band. It’s very progressive but with insanely catchy melodies. I got to listen to a full stream of the album last Monday. Joy! Launch week is now behind me and I can finally breathe easy! Of course, the tour continues with one – two guest spots and interviews a week into November, but that’s a little less intense. First, a big thanks to everyone who commented here and visited my tour stops last week! And to all of you who posted about my release during the week and sent out Tweets. (And even though I’m not on Facebook, I heard I was making the rounds there as well.) You guys just rock. Putting that together did take time though. I spent weeks working on the interview questions and then everyone who signed up got an individual email. (That alone took an entire day.) But it was worth it! 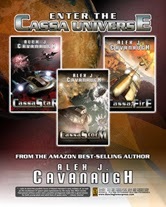 Thanks again for your support and helping CassaStorm launch into the top 100 for space opera at Amazon!! And there’s an excerpt from CassaStorm up at Catherine Stine’s Blog! From the list of those announcing the release of CassaStorm, number 46 – Robyn at Life By Chocolate. Congratulations, Robyn! You win a Cassa mug, Cassa mousepad, Cassa swag, and a $25 iTunes gift card. One prize per person, either a Cassa mug, Cassa mousepad, Cass poster, Cassa magnet, or a signed copy of CassaStorm. Congratulations, ladies! Be sure to catch all of the giveaways! Anyone else see Now You See Me? (Or, now you don’t?) Picking up the new Dream Theater? Think the tour went well? Got any ideas for your next blog tour? Don’t forget to visit Under the Tiki Hut for the inside scoop on the Ninja! Just came back from Under The Tiki Hut, great interview, Another great post, Have a good week. PS As I ordered your book through Amazon UK, There will be a delay in my getting a copy. Yay! I'm first again. Thanks for the shout out about my giveaways. Congrats to the winners! And I loved hearing your thoughts about how you thought your release week went. It was unique to have one question and answer posts. I enjoyed reading the ones I saw. Off to get the girls to swim practice. You've been SO busy! Congrats on another great book launch, and well done to all the winners! I didn't know about the new album. I'll have to check that out. I do have a fondness for Portnoy though, but I know what you mean about their original roots and agree with you on that score. I think you deserve a day off, Alex. Congratulations on such a successful launch! I haven't got around to all the posts, but I'm sure I'll be browsing for a few more days! I really enjoyed Now You See Me as well! Even though it hasn't gotten the best reviews on IMDB! I know nothing about this "Now You See Me"! First I've heard of it. I'll look it up...sounds interesting. Glad you got launch week behind you! Yvonne, sorry there is a delay. Natalie, you're welcome, and thanks again for hosting me and doing the giveaway. Anne, wish he could've stayed with the band. Lan, I don't know why - fun film! Congrats to you Alex and the winners. I bet you had a stressful week but a new book should ease some of that pain. Thanks for all the news. I don't see how you did it last week, touching base with everyone like you did. Clones or no clones, your superpowers were stretched to the limit. Big congrats to the winners and will now check out the movie (was in two minds) now. Yay for all the winners - including me! - and glad you enjoyed Now You see Me. I didn't get to the movies to see this but I can still rent it! Congrats to the winners! PK's book sounds interesting. Saw your interview over at Carol's this morning. Happy Monday Alex! That was a lot of fun!! Yay! Huge congrats to the winners!!! 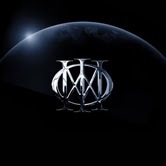 I haven't listened to Dream Theater in a long while, might just give this one a listen. Great tour so far, maybe you should do this full time. Congratulations on such a successful and fun book launch! I quite liked Now You See Me, even when it got preposterous (or maybe because). You're post over at Under The Tiki Hut gives great insight to who you are or the person you want us to think you are...hmmm. Are you really a candy hoarder? I can respect that. I love Sour Patch Kids. Now You See Me- Seen it. Excellent. Great family fun. Two thumbs up. Congrats to all the winners! And I do believe you took the social media sites by storm, Alex. Rock on! Congrats to all the winners. It sounds like you learned a new trick with blog tours. Sheena-kay, it wasn't too stressful. Carol, I just did the best I could last week. And you'll really dig the movie. David, you should pick it up tomorrow. And full time...? Christine, I will share my Hot Tamales. Sometimes! Will have to watch Now You See Me. Congrats to winners. Now You See Me was a lot better than I was expecting it to be. Great twists, fun plot, and even though I saw the ending coming, it took a while to figure it out. Alex! I don't know how you cram so much information into these posts! Amazing. I'd like to see that movie. Will have to check the library. Wow, that was over 160 emails. I can't believe you got it done in a day! Congrats on the excellent week. Haven't seen now you see me yet, but on my list to watch. Congratulations to the winners and to you, too, Alex, for putting on such a great event! I'm sure it was A LOT of work but you pulled it off and it ROCKED! Hopping over to Carol's. Have a great week! I've beens seeing you all over the blogosphere. Glad to know you get such great support, but I'm not surprised. I wish you a great week! Way to go, Alex. You did wonderfully with your launch. Congratulations to the winners! I've got Now You See Me on the list. I guess it's time to bump it up. Now, I'm off to Carol's. I just saw "Now You See Me" a few weeks ago. I loved it! It was really clever. I'm a huge fan of Jesse Eisenberg though so I guess I was kind of partial. Congrats to PK. And the Curiosity Quills anthology looks great. Your excerpt is up on my blog now! Brandon and Bryan, we know what to do with toilet paper! Pat, I just do my best to avoid horses. Samantha, he was quite different in that role. Congrats to Huntress/CD, Marcy, Trisha, Siv and Nutschell! It was an amazing tour Alex. I admire your diligence. I like the sound of the Now You See me film. Just my cup of tea. Ccongrats to the winners! I'm heading over to Carol's. There's a new Dream Theater album coming out? I wonder if my significant other knows. And I've been wanting to see Now You See Me. Glad you enjoyed it. Now You See Me is on Netflix? Huh. How'd I miss that one, I wonder. You put in a stunning amount of work. Really. I never cease to be amazed. Blog tour looked great- congrats! Will head over to Carol's now. Congrats to SK and I will check out PK's blogfest- sounds fun. Hope you have a wonderful day! Best! Congrats on the awesome release week. So glad I could participate. Sarah, you'll have to watch it. Cathy, really? You were tired! MJ, I bet he does now. Rusty, yes it is. And a lot of work but worth it. Well done, Alex! Congrats to the winners of the draw! Nice things you shared in the Tiki Hut. Japanese girls chasing the ninja, why that doesn't surprise me? I'm loving those covers from Curiosity Quills. Yes, living in Japan for a while and get sweet attentions of Japanese women is wonderful, perhaps just candy ...!! I give a big positive to Now You See Me. As one who worked with magic shows I was able to appreciate the story and thought it was presented with credibility. I too highly recommend this film. Congrats to the winners! You always have so much excitement going on here that I feel like I need a nap. Congrats to all the winners :) And congrats to YOU on the fantastic release week! I'm pretty sure I saw you everywhere I visited! Now You See Me sounds like a good movie and the cast sounds great. I might have to check that one out! I think I might check out, 'Now You See Me.' I like Ruffalo. I can imagine how much time you spent answering interview questions! I've loved all of your interviews, though. You've done a great job! What a great way to start the week. Wohoo! Thanks Alex!!! I haven't seen Now You See Me, but it looks fun. It's short wait in my Netflix queue right now. I recently saw World War Z And Star Trek Into Darkness. Both were good; I liked ST more because zombies frighten me to pieces so WWZ was too scary, lol. Should be getting Iron Man 3 tomorrow on Netflix. I'm looking forward to that one! Glad to see your blog touring for CassaStorm is going well!! Congrats on your launch, Alex. You deserve every success for your hard work. Congrats to the winners as well. We regret that we did not see Now you see me in the theater. Now we can enjoy it at home. Al, I bet it doesn't surprise you in the least. Sheri, clones and lots of them! Leovi, had I been older, both! Hart, feel free to snooze. Laura, Star Trek is the best film I've seen all year. Susan, sometimes that's best, right? I do want to see Now You See Me. IT'S ME???!!! WON!! OH, ALEX, I AM SO THRILLED. I HAVE YOUR BOOK ON MY 'to order' LIST, BUT HADN'T YET DONE SO. NOW I DON'T HAVE TO!!! YAY, ME!! I'M LUCKY! THANK YOU!! (I feel like I'm undeserving, because my comments have come so late in the game. But it's been kind of a rough week, so this is really making me smile. Thanks so much! I love you, Captain Ninja! PS I was so excited, I hadn't read it carefully. Now, I'm more excited about my fun gift pack! And I'll have CS on the way asap! Love you and Mini, Alex. It seems like you had a great tour, you must be exhausted! 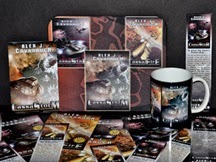 Congratulations to all the winners of CassaStorm goodies. Sit back and relax--your launch was a HUGE success! I'll continue to promote CassaStorm via FB and Twitter with regular mentions of your blog feature! I really enjoyed Now You See Me! Thought it was nicely done. Monday excitement with Carol and PK!!!! I'm off to the Tiki Hut right now. You deserve a day off after last week. Congrats to the giveaway winner. I'm still hoping for that poster at Mithril Wisdom. Ohh yay I'm watching that movie now! I wanted to for a long time. Thanks for the shout out as well!!! Roland, I'll try to keep out of the hospital! SK, you're welcome, and that Blitz was well timed. Congrats to the winners and to you for taking a well earned day off! I haven't seen the movies yet. Congratulations to the winners! Your tour went wonderfully. Storm Alex took over the internet! Just over a week until my next tour starts. Yikes! Thankfully I'm ahead of the game this time. What a great tour it was, Alex. I know you have to be exhausted. I went to most of the sites and commented on a few. ALL of them posed wonderful questions, and I like that "tour interview" idea. A question apiece. And that movie sounds great!! I did enjoy "Now You See Me." Clever movie. Congrats on being done with the busiest part of the blog-based release of your book! you did a great job with the blog tour and you chose the right blogs. I highly appreciated how you took care on the blog tour members. That was unique. Your blog tour is a great example for everyone interested in to organise his/her own blog tour. Congrats on a successful book launch. Glad to hear you are taking a day off--much deserved. Thanks for the Now You See Me review, too. I'm always looking for new movies to watch on netflix. A big congrats to all the winners and I just a lot of stuff going into my TBR pile! What an outstanding launch! Wonderful to have tour destinations into November! Congratulations to all the winners. What a thrill. I can't imagine how you pulled it off, Alex, and made it look so effortless. You are my hero! Dream Theater always delivers! I'm off to the Tiki Hut now! Great launch! You deserve a rest! Christine, it will be awesome. Edi, thank YOU for being part of it! Joylene, trust me - effort was involved. Thank you so much for blogging with me, Alex. And for baring your soul - LOL! Congratulations to all the winners and the new reveals! I'm so glad for you, Alex! Woohoo! I really want to see Now You See Me! Already visited Carol. GREAT interview!! Congrats on making it through launch week. It was so brilliant to see all the support for you. I really want to go see Now You See Me (showing in cinemas here in Oz still). Carol, that was as naked as I get! Lynda, it was so amazing. Go see the film on the big screen - you'll like it. Congratulations on that top 100 spot!!! Sleepy Hollow's on tonight again! Will you be mentioning your thoughts on the season as it progresses, if your opinion changes? Wow, a lot's going on this week! I was kind of iffy on Now You See Me. It was interesting enough, but I thought it didn't make sense sometimes. I loved seeing posts about you all over the blogosphere last week. Simply awesome! Best of luck. Now You See Me sounds really good! Loved your interview at the Tiki Hut! It made me giggle and I learned some good stuff about you, Alex! I passed on listening to the stream, figuring I could wait one more week. I was hoping my copy would be waiting for me today (sometimes I get my Amazon shipment Monday night), but I guess I can wait until tomorrow night to listen to the new Dream Theater. I really enjoyed your interview at Under The Tiki Hut. It's nice to know more about the mysterious ninja! The interview at Carol's was fun to read Alex. Rattlers can sure be scary. I saw Now You See Me at the theater. It was well worth the price of admission. I'll have to check out the new Dream Theatre album - I like what Portnoy brought to A7X when he joined as a replacement for the Rev; interesting to hear DT move away from the heavier sound. I loved the interview/dialogue between you can Carol--she's such a sweet, smart lady. I'm so glad your CassaStorm launch is a big success. But now I've gotta go see Now You See Me, which slipped right be me when it was in the theaters. I miss too many movies. Congratulations on your achievement .. and yes the questions were a good idea - and I enjoyed reading those I came across .. Thanks Alex! Loved the movie Now you see me, kind of reminded me of The illusionist. Cathy, I'll keep everyone updated. Jaclyn, and he's good in it. Kelly, he didn't go back. Larry, downloaded mine already this morning - rocking to it right now! Jamie, they went back to their roots while still moving forward. Siv, it did with all of its trickery. Very entertaining interview! Hope you're now getting a chance to breathe. I signed up to PK's blogfest, as I love time travel. I really want to see "Now you see me" Have fun on your day off! CONGRATS to all the winners! It was fun stopping by the blogs to see what the question/answers were. The questions were a ton of fun, Alex. I bet they were a ton of work! Congrats to all the winners. Nick, I'm taking it easy now! Mina, they were a lot of work but worth the effort. Enjoy your day off Alex! Sounds like you deserve it! I shall go and check out your visit. I could use a break at the Tiki Hut. Pleased that your launch week has gone so well. And yes, 'Farcebook' has been a good way to share your postings and your tour. Facebook doesn't need to be time-consuming and many of our mutual friends on here can verify that I share a huge amount of blogs on there. Congrats to those who got a prize. And I mean this in the nicest possible way, I'm glad you are taking Wednesday off. Enjoy your day off Alex (you deserve a week off). It was a fun tour to follow, Alex. Now You See Me was a great flick. I really enjoyed it. I'm impressed Netflix had it so soon. Hope you're enjoying your time off!!! Heading over to check your Tiki Hut escapades! I've heard good things about Now You See Me. Can't wait to see it! The covers look great too! On initial impression, this may be my favorite DT disc since "Scenes From A Memory." I like your characterization-a return to their progressive sound. This was just to say I was here. Still short on time and energy. I'm a little bit sad being not one of the winners, but it's not so important. I still happy with your success! And I appreciate your efforts put into this whole campaign. You did a great job! Gary, thank you for sharing on Facebook. Funny I don't need to be there to be there. Rachna, that it coming in November! EJ, you're right, it was the perfect rental. Larry, I downloaded it this morning AND my CD is on its way. Must have both. And awesome disc - really digging it. Zoltan, still four other places you could win - just leave a comment! Dream Theater seems very interesting so progressive rock! Please advise of the release of their latest album! Congrats to all the lucky winners and congrats to you for such a mega-successful launch! I love the CQ anthologies - they seem to be putting out a lot of great work. Your hard work paid off. I hope you have a restful middle of the week. LOVE Dream Theater. And I had a lot of fun reading through the QandA's!! So nice to visit the Tiki Hut. Wish I could live there, it's so peaceful-looking. What a wealth of information and reviews, Alex! Congrats! to all the winners!!! We saw Now You See Me for date night and yes it was a fun movie. Enjoyed it very much. Lots of holes in the plot but tons of fun none the less. Off to the Tiki Hut now. Cate, I'll let Carol know you want to move in. I liked your idea of answering a different question at every blog stop. Yours was the most interesting and best launch tour I've seen. You've put together a great blog tour so far. I can't even imagine the type of work, connections, and planning that must go into planning a successful blog tour for anyone. oooh, thanks for the movie rec. Putting that one on my list. Yes! I really like Now You See Me! Tina, I think the questions worked very well. Carrie-Anne, it was many months in the making. I've been looking at that Now You See Me movie. I wonder if it will show up on the Netflix streaming option. Eek, I haven't popped in yet to comment? Strange. I know I read the post. Must have been the computer "glitch" day--you know, the day my computer hated me? It happens, right? Now you see me, is one of my favorite movies I have seen in a while. Really enjoyed the cast. It was one of the very few I didn't see coming. Huge congrats to the winners! I'm heading over to Carol's. Oh Alex, I can only imagine how much time it must've taken to answer and send all those individual questions - it was a very nice touch though. Congrats on such a spectacular launch! How cool is it that you're not on Facebook but have a presence there because of your fans/friends. I'm a fan of interviews and love to learn from them. I have really been enjoying all of yours. So glad the launch is going so well for you. Man, I had to climb mountains and swim shark infested waters to get here today...erm, tonight. Congrats to Robyn and all the others, too. PS: Thanks again for the unexpected (but not surprising:) kind words. Nicki, I started working on them when people started signing up. Sia, Z just wasn't a great movie. Mark, you had your family to deal with - no apologies necessary. Thanks for the movie review. Now You See Me intrigues me. I would think that all that hard work will pay off. We'll be buying the book, soon. I sent an email to your earthlink address. I don't know if that's your only one or if not, whether you check it often. Questions on using Feedly. I thought the individual questions were a great idea - a good incentive for getting folks to visit many tour stops! I'm curious to look into PK Hrezo's blogfest. There are so many things I'd like to go back into time to do and change, but I have to consider the butterfly effect too! Heya, Alex! So interesting to learn more about you! I'm always interested in learning more about fellow Authors/Writers and what makes them tick. Congratulations on all of your Blog-o-Sphere success over the past days, you totally deserve it! Hi Alex, I just stopped by to say congrats on your new release. I've seen it on several blogs today. Way to go!